carol ann cole today: Happy Birthday to a special "boy"
Happy Birthday to a special "boy"
Happy Birthday to "The Boy" my son James Scott. 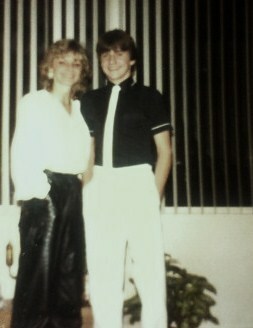 For his 16th birthday I gave James this very cool skinny white leather tie. We dressed up in our best black and whites and headed over to Toby's restaurant on Yonge St. I had purchased my leather pants in Montreal and leather was ultra popular at the time - trust me! I knew James wouldn't wear leather pants but I thought a leather tie might work - and it did. This is one of my favourite memories. More about capturing memories later.